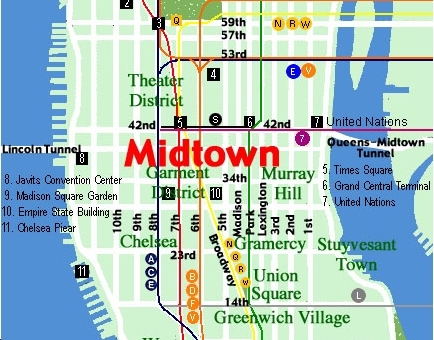 Hello, the very latest made-up trend you must know about unless you are some sort of plebe is the simple fact that Midtown is back. According to everybody. Vanity Fair editor Graydon Carter tells the New York Observer that Midtown is back. You know who agrees with him? Catherine Malandrino, and restaurateur Gherardo Guarducci, and Waris Ahluwalia, "the turbaned jewelry designer and fixture in Wes Anderson films," and nightlife photographer Patrick McMullan, and socialite Ann Dexter-Jones, and socialite Bettina Zilkha, and socialite Lisa Anastos, and socialite Derek Blasberg, and fashion designer Prabal Gurung, and Le Caprice owner Richard Caring, and designer Devi Kroell, and gallery owner Neal Grayson. Furthermore, the Observer reports that the following people have been spotted, at one time or another in the recent past, in Midtown: Paper magazine's Mickey Boardman, Penélope Cruz, Pedro Almodóvar, Debbie Harry and fashion couple Isabel and Ruben Toledo, Madonna, Mick Jagger, Anna Wintour, Zac Posen, L'Wren Scott, Richard Gere, André Balazs and Sumner Redstone, Bill Murray, Meryl Streep, David Chang, J Lo, Naomi Campbell, Clive Davis, Carolina Herrera and Calvin Klein, Agyness Deyn, Terence Koh, Vito Schnabel, Arden Wohl, Kirsten Dunst, Michael Stipe, Charlotte Ronson, and Julie Gilhart. So you see, this is the new Midtown: Populated by celebrities, socialites, scenesters bored with downtown, and, above all, the rich.